Thank you for choosing accusonus ERA De-Esser. In order to better understand the main concepts and operation of ERA De-Esser, please take the time to read this user manual. 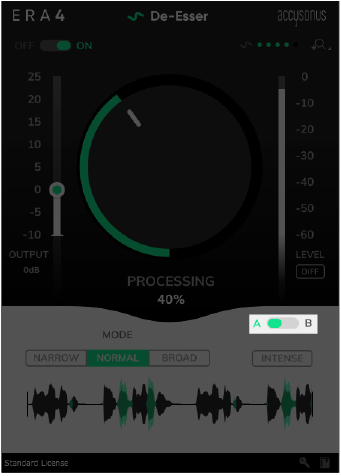 ERA De-Esser is an one-knob audio effect plug-in that offers precision-grade de-essing and automatic audio repair functionality without compromising audio quality. 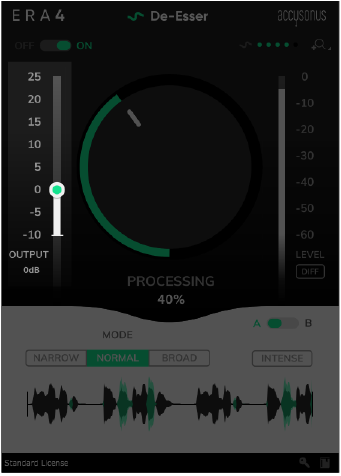 Based on the multi-patented accusonus algorithms, ERA De-Esser simply works and allows for efficient sibilance removal from audio recordings. You can find the latest ERA De-Esser installer in your accusonus "My Account" page, in the “Downloads” section (https://accusonus.com/dashboard ). For more information about installation and activation see the Activation Manual, which you can find along with the installer. 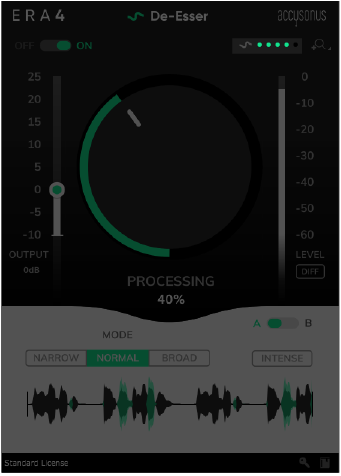 ERA De-Esser supports the following sample rates: 44.1 kHz, 48 kHz, 88.2 kHz, 96 kHz. 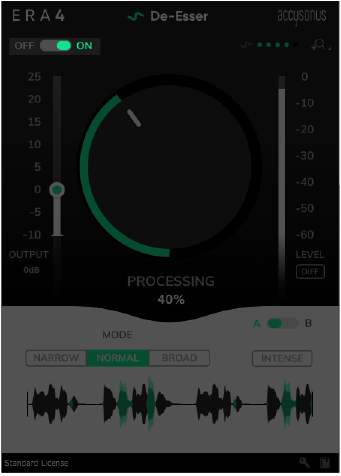 Warning: ERA De-Esser is designed to be used as an audio effect plug-in inside Digital Audio Workstations or Non-Linear Editing systems. Only the plug-in formats listed above are supported. ERA De-Esser does not operate as a stand-alone application . Warning: There are just too many combinations of DAWs and plug-in formats out there, so there's always something we might have not tested. 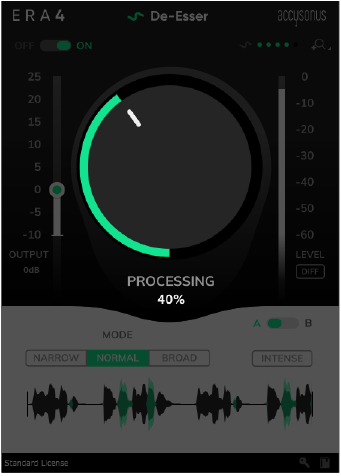 If you don't see your DAW above, you can always download the free, fully-functional 14-day trial and see if ERA De-Esser is supported for yourself. If you encounter any problems, let us know at mailto:support@accusonus.com . This is the main control of ERA De-Esser. Most of the time you don't have to do anything else. Just dial in the amount of processing you want and you're done! The knob values range from 0% to 100% and control the amount of processing applied to the audio signal. There is also a second button named Intense . When enabled, it will increase the processing intensity. It works indepedently of the three modes. Tip: Using the different modes allows you to focus the plug-ins detection and processing to the problematic regions. Tip: When you have found a setting that works for you, you can use the Intense button to get some extra processing. Example: We are all familiar with the harsh ``ess'' sounds singers or speakers can produce during voice recordings. These sounds are concentrated in the higher frequencies, but the range could differ depending on the source. 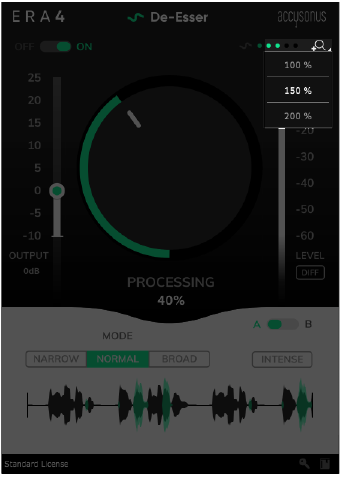 For this reason, you can use the appropriate mode to tell ERA De-Esser to focus only on the problematic frequency region. 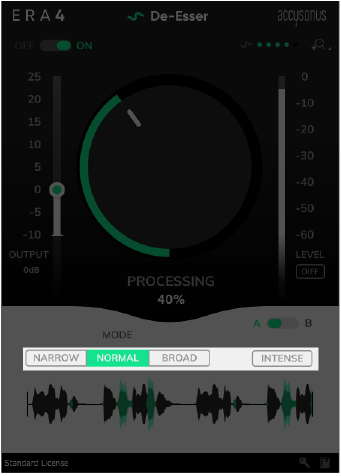 Broad mode will apply processing on a wider frequency range, opposed to Narrow mode, where processing will be applied on a narrower part of the spectrum. On the right top of the plug-in window, there is a processing indicator. It is actually a visual cue to ERA De-Esser and will help you understand when and how much process is happening. The number of active leds depends on the: a) amount of processing and b) input level. Due to the nature of sibilance reduction, the level of the output signal can be lower than the level of original signal. The output gain works as a make-up gain and allows you to adjust the level of the output signal. Note that this gain is also bypassed when the ON/OFF switch is set at OFF. This is very helpful when comparing the original and the processed signals. There might come a time where you're not sure which setting is better. Note, that you can adjust the plug-in controls (Processing, Output Gain and Mode) independently for the A and the B setting. You can use the A/B switch to quickly compare two settings and help you in your decision. The ON/OFF switch allows you to turn on or off the plug-in processing. When the switch is at the OFF position, all processing is bypassed and the original signal comes through ERA De-Esser untouched. ERA De-Esser offers the option to resize the plug-in window. This can be especially helpful if you have large or high-resolution screens or you just want to focus on a specific task. Click the zoom icon at the top right corner and choose between three settings.